I am always searching for ways to create one-of-a-kind components to take my jewellery designs to the next level. Recently I discovered that I can put my pencil crayons to work and create some lovely focals to incorporate into my work. 1. Prepare the metal and create a "tooth" by rubbing your metal with fine steel wool or fine grit sandpaper. Clean the piece with soap and water. Dry it. 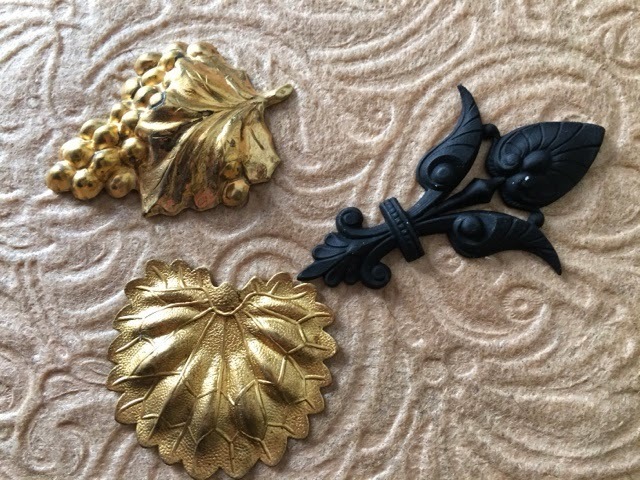 This photo shows vintage brass stampings before prep. The black piece has been prepped and is coated with black gesso. 2. Coat each piece with gesso. This product is found at art supply stores and is used to prep a canvas. White and black gesso offer great backgrounds for this project. 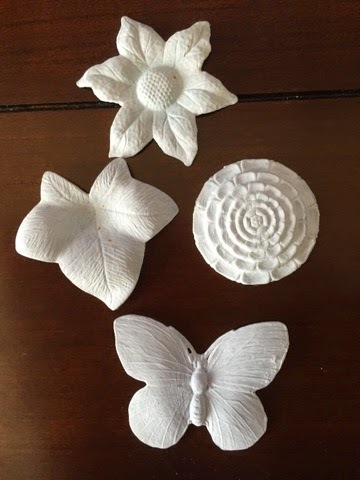 These pieces were coated three times with gesso. The leaf still has a bit of orange coloured rust that can appear during the coating process. 3. So the experts all say it is important to use Prismcolor pencils for colouring the metal. There is a higher wax content and they blend better in the next step. 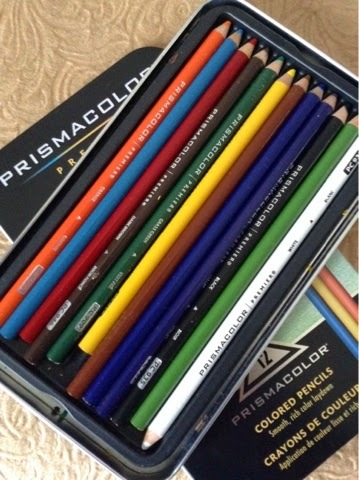 Here's my pencil crayons. They are expensive so use one of those 40% off coupons you know where when you decide to invest in them. I must use a lot of yellow! Start colouring. There is no right or wrong here. Also you will see that, on stampings with lots of raised areas, your pencil crayon doesn't get down into the crevices. Don't worry. 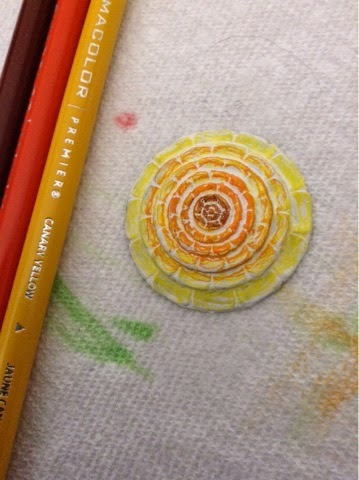 I coloured the whole piece yellow then orange in the centre and brown to finish the centre. 4. Blend with mineral spirits or turpentine. Use a brush and keep it fairly dry. Too much liquid creates a big smear instead of a subtle blend. 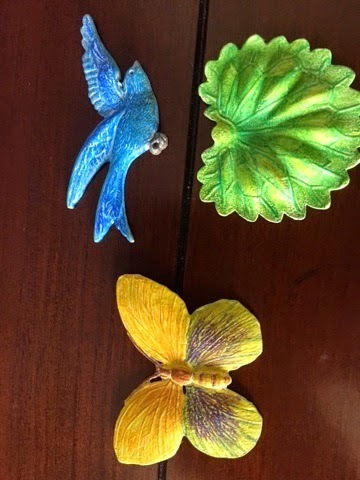 Here's a picture of stampings in various stages of colouring and blending. I usually blend once then go in and reapply colour then apply more mineral spirits to blend and so on until I'm satisfied. Use general colour principles such as complementary colours, apply dark to low areas and light colours to high areas to make them pop. Have fun. 5. Some articles I've read suggest baking your piece in a toaster oven to set the colour. I've not tried that but maybe you want to. 6. Depending on how I intend to use the piece, I will have made sure it was hole punched, etc. before I started working on it. If the back will be seen, I do the whole process on the back as well. Final step is to glaze the piece to set the finish. Any of these products will do the job: Diamond Glaze, ModPodge, clear nail polish. 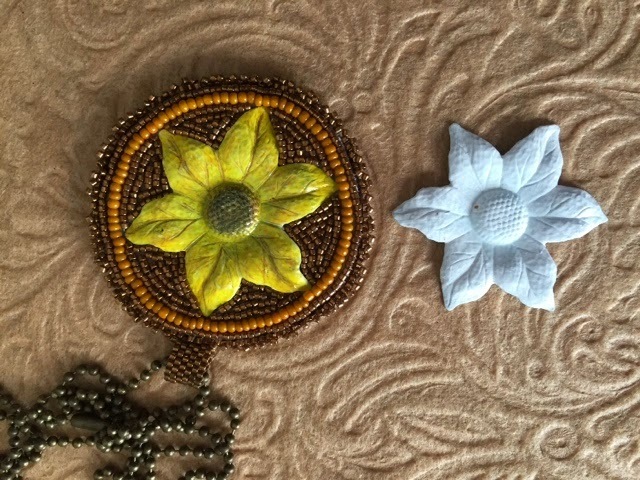 Here is a brass flower with gesso only and one that I coloured and incorporated into a bright and sunny bead embroidered medallion. 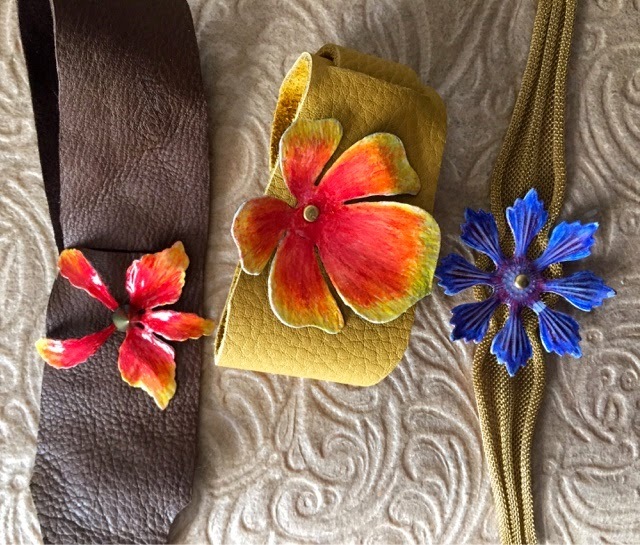 Some flowers I finished and riveted to brass mesh and leather strap bracelets. Email me with questions or comments. Also, share pics if you try the technique. Have a great week and Happy Mother's Day! I'm going to try this! I'll let you know how it goes. Thank you for sharing the process!